Amanda Quick, aka Jayne Ann Krentz, returns to Victorian England for the second book in a trilogy that begins in the contemporary book, In Too Deep. This trilogy is actually a part of Ms. Krentz’ Arcane Society series, that delves into the world of people who use their psychic abilities to pursue evil and evildoers. The psychic stuff can become tedious. So can the stilted conversation that must have been typical during the time period. But the underlying story is interesting, and the characters and their interaction with one another is engaging enough to overlook any wearisome passages. Virginia has a psychical ability that allows her to “read mirrors.” Basically, she can look into mirrors and reveal what they have seen. She uses that talent to make a living for herself, rather like a fortuneteller. Owen’s psychic abilities help make him a good investigator. When Owen saves Virginia one night, the couple become a team, searching for a serial killer who uses psychic talent and psychic weapons. While it’s a dangerous mission, Owen and Virginia find time to fall in love with each other. It’s a rather tepid courtship (at least in most ways), but by the end, Virginia understands that Owen definitely means business and that his love is pretty absolute. 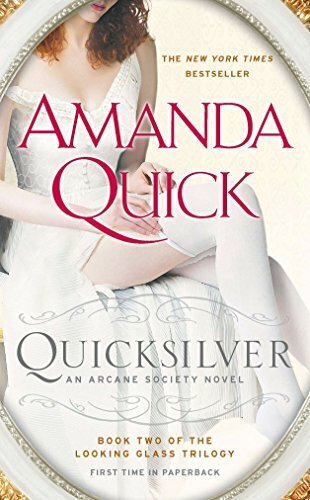 Ms. Quick does an admirable job of transporting readers to Victorian England’s shadowy world (think Sherlock Holmes). It’s a bit different than the usual view of balls and high society courtships with rides through Hyde Park. The psychic stuff does distract a bit, but the intrigue and the likable characters make up for it. Lezlie Patterson is a former writer and columnist for The State newspaper, Columbia, SC.